Did you all have a wonderful holiday break? I hope you all had a fantastic time with your loved ones. It's hard to believe but the year's almost ending soon. Some years seems to flash by too soon but this year actually felt rather long for me. However, I learned a lot this year and met a whole lot of awesome people, so despite its hardships I don't regret a thing. With the new year approaching fast, it's inevitable that we think about New Years Eve. It's the time to celebrate, say goodbye to the current year and hello to the new year. Do you have any plans for New Year's Eve yet? I know I do and I'm already planning out my outfit and makeup. Unfortunately, I just ran out of my favorite BB cushion and I know I won't have time to restock on it before NYE, so I've been looking through my stash to find the next best thing. I have 2 great contenders at the moment and this Catrin Illustar Luminous FaceFit Foundation is one of them. I've been using this foundation on and off for the past 2 months and I really like it. Let's get to know it! Product Description: The Catrin Illustar Luminous FaceFit Foundation is a 3 in 1 creamy foundation in compact form. The compact comes with a built-in mirror and an unique foldable application brush. The foundation is formulated with various nourishing oils (e.g. argan oil and rosehip oil) to hydrate and care for the skin. It has a highlighter, purple color corrector, and beige foundation to help even out skin tone and provide a natural glow. The foundation also provides sun protection of SPF 50+/PA+++ as well. To Use: Use the brush provided to pick up the creamy foundation product. Apply it onto the skin evenly. 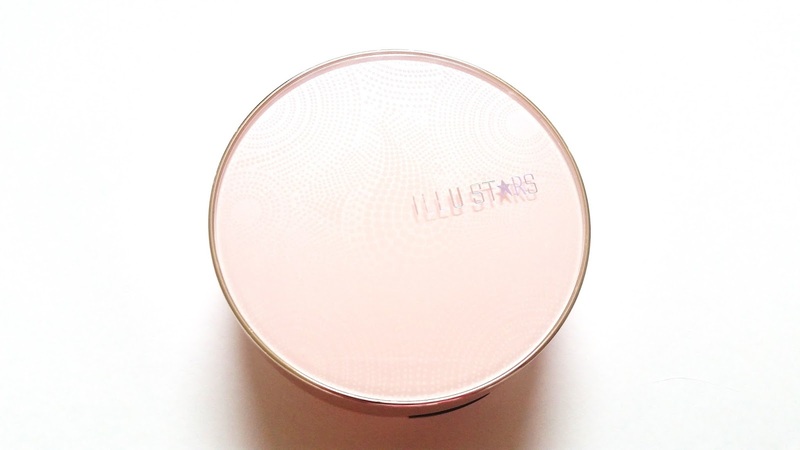 Packaging: The foundation compact is the size of a normal cushion. It has a built-in mirror and a neat foldable brush. The brush can be used 2 ways (flat or folded) to apply the foundation. Under the brush compartment is the creamy 3 in 1 foundation. Like many other compacts, the foundation compartment can be popped out and replaced with its refill. Scent: The 3 in 1 foundation has a floral scent that's not too strong. It also has a bit of that typical makeup scent in the mix as well. Color: There are 3 colors in the foundation pact and they are the white highlighter, purple color corrector and beige foundation. 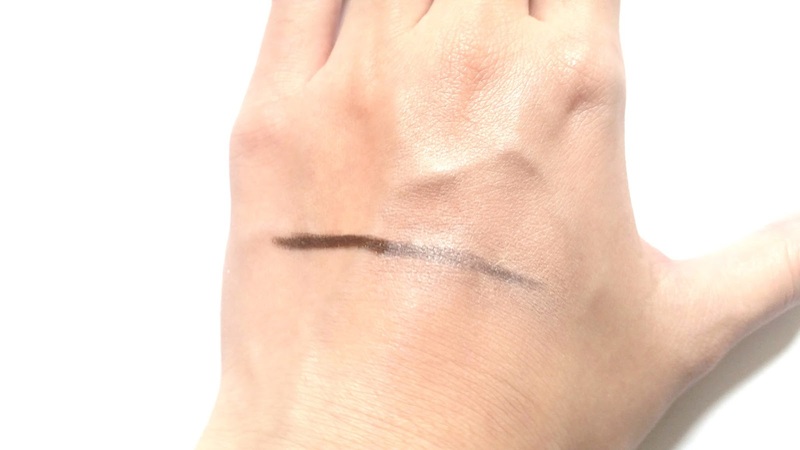 It's recommended to mix the 3 colors together before application but you can also use them individually if needed (although it might be a little hard to pick out the highlighter and color corrector). 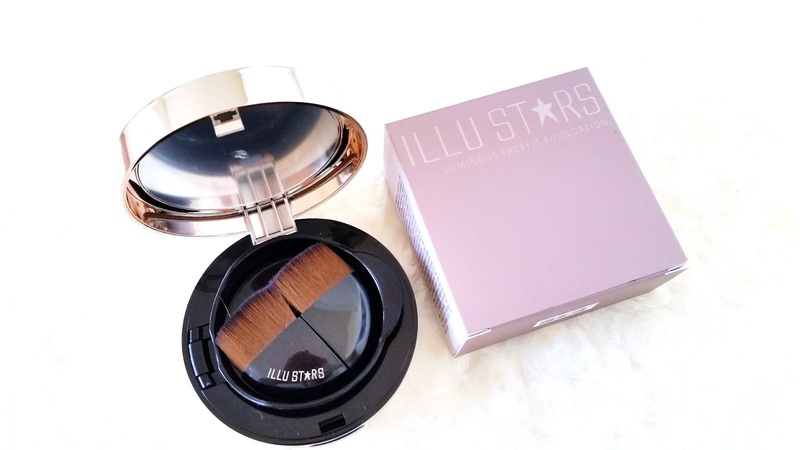 The Illustar Luminous FaceFit Foundation line only has 2 shade options and they are Light Beige and True Beige. Texture: Despite its compact look, the foundation is actually really creamy and easy to apply. Especially with the brush applicator provided, it just glides on the skin easily. The foundation has a creamy mousse like texture that's light and airy. It doesn't feel heavy on the skin either. Michelle's Thoughts: I love the cute designs this foundation has and while the cute floral pattern on the creamy foundation might have drew me in, it was the neat brush & 3 in 1 formula that made me stay. 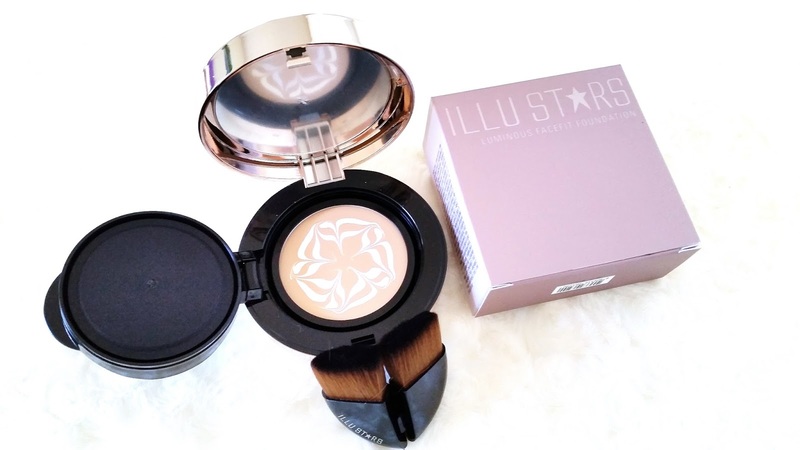 The 3 in 1 highlighter, color corrector, and foundation combo is perfect. Although the beige shade is just a bit off for me, with the highlighter and color corrector mixed together, it actually works pretty good. The foundation has decent coverage that's light to medium but buildable. Although like most foundations, if you apply too much it can get cakey. The foundation offers great sun protection and has a variety of hydrating and nourishing ingredients. It has fairly good stay power and with a good primer it can last over 8 hours. (Although on its own it can generally last about 6 hours.) This might be a creamy compact foundation but it doesn't feel heavy on the skin at all. Instead, it applies smoothly and feels lightweight as well. Aside from the formula, I really like the packaging of this foundation as well. It is bulky but it's pretty much the same size of a cushion makeup, so it's not too bad. The compact is travel friendly and the built-in mirror makes easy to apply on the go. The provided brush is probably one of the best parts of this foundation. I was worried at first the the brush might not work well since it looked kind of meh. However, once I tested it out, it actually works really great. The brush is pretty soft and dense, so it makes the application easy. Its foldable style also makes it easy to apply foundation on those hard to reach areas. Just 1 layer of foundation. Final Thoughts: I'm pretty happy with the foundation overall. It has a great formula and a neat brush for application. Although it's not perfect and its lacking a bit in its lasting power, with a good primer that can be easily fixed. The compact is travel friendly and it makes touch ups easy. It offers great skincare benefits and provides really good UV protection. Would I purchase it in the future? I think I'm going to get the refill in the future because this is a really nice foundation. I'm usually pretty unlucky when it comes to compact foundations, however, this one actually turned out great. Do I think it's worth a try? I do! The foundation's 3 in 1 formula is worth it and it saves a bit of time for those busy mornings as well. The handy little brush is a great tool that helps with application and it can be used to apply other foundations as well. Overall, this is a great foundation and I'm really happy with it. Disclaimer: This products was sent to me for review purposes. All opinions are honest and my own. This post contains some affiliate links, for more information check out the full disclaimer.